Nice shot Craig - They were a breeze to drive and handled well both loaded and empty. The Scania, whilst not my favourite coach... were good to drive and extremely good on fuel... comfortable for the pax as well. Sunliner was a very well run company with good equipment and good staff, it was a sad day when they closed. And for what its worth... I actually like the Neoplan look!!! About 10 / 12 years ago, I came across two ex Sunliner Neoplans (then painted in Bayside Buslines green colours) for sale in a campervan yard, on the Gold Coast Highway near Logan. They wanted $45,000, each for them. Unfortunately, they had rusted out by then and were leaking badly (it was a very wet day) the salesman told me they were in excellant condition and the only reason the floor was covered in water, was that someone had left the roof hatch open!! !, I think not! needless to say I didn't buy them. I saw a Neoplan in WA as a motorhome a few years ago. Unmistakable. An operator out in the Surat Basin area of Queensland had a Neoplan coach for a while. I think it may of been McGuire's Coaches?, I remember seeing it in Hervey Bay a few years ago doing a school camping charter. It was very neat and tidy and still looked good. Didn't have a camera with me that day unfortunately. If my memory is correct, the driver that was hailed a hero for rescuing all of the passengers and luggage ended up meeting a coach at a changeover point sometime within 6 months later under the influence of alcohol. Everyone in the industry at the time was talking about it, the crash and fire stressed him out so much and he got on the grog as a result. It was a real shame to hear and still is. Your 100% right Peta, I knew the driver in question, prior to this incident he was a very popular man with both passengers and fellow drivers, and he was nearing his retirement when all this happened... a terrible way to end his working days. In saying that it wasn't good for the passengers he had just picked up in Nambucca Heads either. No such thing as councilling back then - you just had to "tough it" out. I always wondered what happened to our driver involved in the Cowper crash. I know he was in a bad way from injuries, but the fact of seeing a prime mover heading straight toward you, with nothing you can do but shout a warning to the pax and then leaping into the stair well to save yourself must have left huge emotional scars and probable depression issues - Does anyone remember the chaps name at all? Cheers for the update re these two drivers CJT and yes your point was well taken regarding this! Did the accident inspection ever take that into consideration and review the McCaffs drivers roster for rest breaks versus log book entries? davidquentinorf wrote: Did the accident inspection ever take that into consideration and review the McCaffs drivers roster for rest breaks versus log book entries? Last edited by dominodc122 on Tue Jun 04, 2013 8:27 pm, edited 4 times in total. That wouldn't have been a Greyhound Pioneer coach Brisbane bound would it Peta? Quote fm2790 "That wouldn't have been a Greyhound Pioneer coach Brisbane bound would it Peta?" No mate, as we were saying in the text it was all about Sunliner vehicles and drivers. The 2 Denning coaches involved in the Kempsey disaster were not rebuilt.They were scrapped as the authorities would not allow us at Denning to rebuild them due to the sensitivity of this major accident.The Vin no's were listed not to be used again. CJT wrote: The Scania, whilst not my favourite coach... were good to drive and extremely good on fuel... comfortable for the pax as well. Sunliner was a very well run company with good equipment and good staff, it was a sad day when they closed. And for what its worth... I actually like the Neoplan look!!! One of these Scanias turned up at a property in Woodridge being converted to a motorhome and when finished it was a palace on wheels it looked really good but it had a hell of a lot work done to it. The coach is still there to this day and is kept looking well maintained. Its the only Neoplan/Scania that I know of in Brisbane. rodd.hood wrote: The 2 Denning coaches involved in the Kempsey disaster were not rebuilt.They were scrapped as the authorities would not allow us at Denning to rebuild them due to the sensitivity of this major accident.The Vin no's were listed not to be used again. We are hearing conflicting reports oothe Kempsey bus accident. You are saying that the coaches involved were not rebuilted. How come there people saying one of them lasted another 14 or years before it was completely scrapped after the second accident in QLD. Please explain!!!!! The VIN plate off one of them was certainly reused however my belief is that it was applied to an older Denning in order to boost that coach's longevity. Re Kempsey disaster V.I.P. was not involved.The Neoplans were imported for Max Holman 5 went to V.I.P. and the 6th went to a company in Melbourne i cant remember there name.After V.I.P. went out i got one of them and when i went i dont know what happened to mine i beleive it ended up in N.Z.Sunliner never had any of them. Location: Taree mid nth Coast N.S.W. Favourite Vehicle: Mk iv Merc. Does anyone know what its rego was? i was visiting denning at the time they were being rebuilt. They scrapped the bodys and just kept most of the running gear that could be salvaged and was then used on the new chassis which i guess would have a new vin number as well. HiHo wrote: Re Kempsey disaster V.I.P. was not involved.The Neoplans were imported for Max Holman 5 went to V.I.P. and the 6th went to a company in Melbourne i cant remember there name.After V.I.P. went out i got one of them and when i went i dont know what happened to mine i beleive it ended up in N.Z.Sunliner never had any of them. - Tara Coaches (Coleman), Tara, QLD 574 HWH. Sitting withdrawn in 2011. 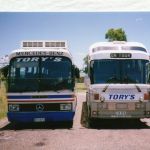 "One of these Scanias turned up at a property in Woodridge being converted to a motorhome and when finished it was a palace on wheels it looked really good but it had a hell of a lot work done to it. The coach is still there to this day and is kept looking well maintained. Its the only Neoplan/Scania that I know of in Brisbane." And where about's in WOODRIDGE, would that just happen to be ?